I decided to prepare a small booklet where I can write down relevant (relevant for me, being an Oracle DBA, not a full time developer) examples that will help me recollect basic cx_Oracle code patterns when I need them. This is my first sidekick booklet and I’m not even sure if I’ll stick with this form of publishing that certainly demands more time than short notes I’m usually writing in Forums section. Unfortunately, I do not code in python as much as I would like nowadays, so you should take this as a fair warning: python newbie aboard! It was not on my agenda to write down a comprehensive cx_Oracle tutorial by any means. The main objective is to keep my notes about cx_Oracle module ready for the time when I’ll need them — and this is only a couple of times per year, thus cx_Oracle details can easily slip from my mind. My primary source of information was: cx_Oracle documentation, articles on OTN, recently released book “Python Programming with Oracle Database” by Ray Terrill and (of course) Google. Part 2 – Hello World! How to retrieve some basic information about environment? #          Let code speak for itself! We should always close the connection explicitly when we’re done! you write DBA friendly code: clientinfo, module and action. We all know (righ?) how important is code instrumentation, Oracle supports instrumentation with package DBMS_APPLICATION_INFO and cx_Oracle conveniently provides API for the same. # Autocommit -- read/write attribute. # By default autocommit is off (0). # Ping (>=10g R2) -- check if connection to the server is still alive. # over the shoulder. Nothing more than (in)security by obscurity. # can easily retrieve the password! I must say that I’m not happy with the login.py and I’m looking for a better (secure) alternative on Windows, specifically I’m looking in Microsoft DPAPI direction. Most likely I’ll investigate .NET class library System.Security.Cryptography.ProtectedData with IronPython for a start, but this is another story for another time. Let’s see some basic, Hello World kind of examples to illustrate better the cx_Oracle usage. query = "select banner from v$version"
# End of dense Hello World! However, for simple scripts one cursor that is reused with different statements will most likely be more than enough. Cursor objects has many methods and properties. In Part 3 I’ll cover the most important ones. Cursor objects are at the heart of cx_Oracle module — it’s where the actual work is done. That’s why I decided to break this section in subsections, each covering code pattern related to a particular cursor object method or attribute. "select to_char(sysdate,'dd.mm.yyyy hh24:mi:ss') from dual"
sql = "select id, name from dummy"
Other attributes not mentioned above that you might be interested in: bindarraysize, arrayvar, fetchvars, inputtypehandler, outputtypehanlder, rowfactory. # execute method of cursor object. query = "select sysdate from dual"
# because execute method does this for us implicitly. # Parsing is shown here solely as a reference. cx_Oracle cursor object has two methods for executing SQL statements, execute() and executemany(). I’ll cover both methods with code examples. # Execute examples (with and without bind variables). ddl_1 = "CREATE TABLE codebook (id NUMBER(2), name VARCHAR2(20))"
ddl_2 = "ALTER TABLE codebook ADD CONSTRAINT codebook_pk PRIMARY KEY(id)"
ddl_3 = "DROP TABLE codebook PURGE"
-- This is completely uselesss procedure. cx_Oracle.cursor.executemany() method allows execution of many insert statements at once. Bulk inserts can considerably improve performance. # Bulk insert example with executemany. # as my input for bulk insert. # of columns in emp table. VALUES (:1, :2, :3, :4, to_date(:5,'DD.MM.YYYY'), :6, :7, :8)"""
We can retrieve rows from the select statement with cursor iterator or “explicitly” with one of the three methods for fetching data from Oracle (ok, there is also a fourth method, fetchraw() that is not covered here). # beneficial as you might think. # Fetching row one by one with fetchone() method. # something about the "business" rule: we expect to process exactly one row. # cursor iterator. It's up to your preference to pick the pattern you like. # Imho, cursor iterator is more concise code pattern. # Fecthmany(n) - if not specified, then n = arraysize. # reach the end of resultset. # memory to keep the list in. At the bottom of this section you’ll find PL/SQL code used in examples. # Raise salary with procedure emp_pkg.raise_sal. # and reports (returns) number of updated rows. print "Department doesn't employ people with commission." # The BEGIN/END is not required but recommended for clarity. plsql = "BEGIN emp_pkg.raise_sal(:ename, :percent, :out); END;"
# hire_date, since it's of DATETIME type. 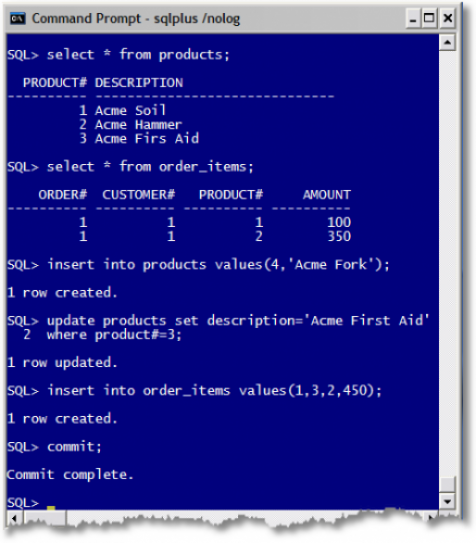 # PL/SQL function list_all has no parameters! -- Demo PL/SQL package EMP_PKG. cx_Oracle.Error — base class for all other cx_Oracle exceptions. cx_Oracle.InterfaceError — subclass of cx_Oracle.Error class, it covers errors at interface level rather than database itself (for example if you close cursor and then try to execute something with closed cursor object, you’ll get InterfaceError) . cx_Oracle.Database — subclass of cx_Oracle.Error class, it’s raised for database related errors. cx_Oracle.DataError – subclass of cx_Oracle.Database, raised for data processing errors, for example division by zero. cx_Oracle.OperationalError – subclass of cx_Oracle.Database, raised for database operational errors that are outside programmers control. cx_Oracle.IntegrityError – subclass of cx_Oracel.Database, raised for data integrity errors (for example violating primary key constraint). cx_Oracle.InternalError – subclass of cx_Oracle.Database, raised for Oracle internal errors, I would expect ORA-3113, ORA-600 or ORA-7445 to be covered with this exception, but honestly didn’t take the time to prove with the test. 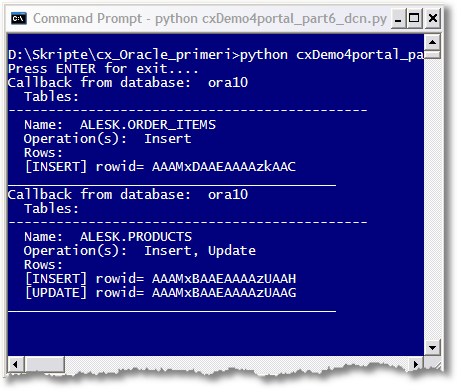 cx_Oracle.ProgrammingError – subclass of cx_Oracle.Database, syntax error, referencing non-existing objects etc. cx_Oracle._Error argument is returned in a tuple from exception object with the attributes: code, offset, message and context . sql = "insert into emp(empno,ename) values (:1,:2)"
print "Sorry, this employee number is already taken." In this section I’ll cover basic code patterns for handling LOB’s, CLOB, BLOB and BFILE, as well as working with legacy (deprecated) LONG and LONG RAW types. For truly large objects (which imho, doesn’t belong in relational database), that are gigabyte(s) in size, you’ll likely have to look somewhere else for memory friendly code, that is reading and/or writing LOBS in chunks (start with cx_Oracle documentation, section about LOB’s). Example for deprecated LONG/LONG RAW data type is here solely because Oracle dictionary itself still has tables with this deprecated type. values (:empno, :pdfname, :pdf, :memo)"""
# is with cursor iterator. Do no use fetchall(). -- picture King.jpg already exist in directory! select empno, picture from emp_resume where picture is not null"""
print "File for emp#" + str(row) + " exists!" print "File for emp#" + str(row) + " doesn't exists!" # thanks to LOB method getfilename(). # file from LONG RAW. # Needless to say that I don't have a clue why. # memory for define buffer. # serveroutputsize is plain wrong!? # worse in range of couple of kilobytes. In this section I’ll try to cover various topics that were skipped so far. It’s very likely that this particular section is the one, that will see most of the changes over time. Topics covered here are arguably not the most important ones, nevertheless they deserve to be covered with concise examples. I found Anthony Tuininga article (btw. he is author of cx_Oracle) especially good introduction to DCN with python. Otherwise, my experience with Oracle DCN is of limited use right now, I’m still learning and experimenting. DDL code used in this example is published at the bottom of this page. What is the use of DCN? DCN can be used for example to refresh semi-static tables (such as code books) on middle-tier, saving back and forth trips for every (web) client request. # -Oracle by example OTN article, author unknown. # dictionary in such situations. # as their combinations derived from cx_Oracle.OPCODE_???? # constants and my own experimentation. print "  Rows: all rows"
# every rowid you'll get back. # such as Insert - rowids=False. # You can subscribe individual operations, such as DML. # ... I tried to subscribe to DDL events, but it didn't work!?? How do you run above example? the database will execute callback to python application and you should see something like picture 2. Remember, DCN works only with Oracle10g R2 or higher. Picture 2 – python app, after we commit changes in sqlplus. OCI Session pooling was introduced in Oracle9i R2. Session pool is especially useful for web based applications where number of stateless sessions are acquired for short period of time. Opening session for each request in such situations would be too costly. cx_Oracle supports session pool with SessionPool object. This page serves only as an introduction to cx_Oracle SessionPool. I couldn’t find much info on the web, especially about some nuances that I found (skewed timeout for the pool, some parameters are scarcely documented and not entirely clear to me). # cx_Oracle.DatabaseError: ORA-24418: Cannot open further sessions. # Oracle still maintaines ten database sessions. # between min and max!?). # termination is turned off. # in OCI or cx_Oracle. # try to catch other fatal errors such as ORA-3113, ORA-7445, ORA-600). # In Else section I'm releasing session back to the pool in ordinary fashion. # important if you're using SessionPool. # your session has been killed! # will report wrong counters. print "Session droped from the pool..."
print "Session released back to the pool..."
It’s fairly common that we need to capture some dbms_output from PL/SQL stored routines. Below is a simple code pattern showing how to handle output from dbms_output in python script.